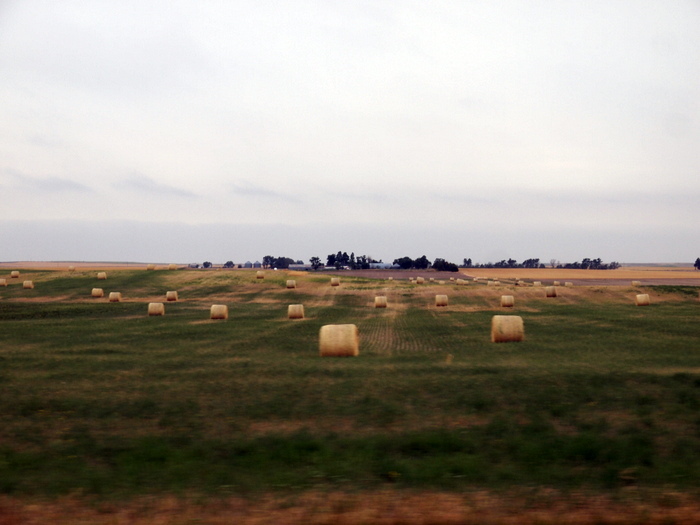 Saturday morning we left Colorado and headed northeast into Nebraska. After nearly three months in the same state it felt good to be on the move again. 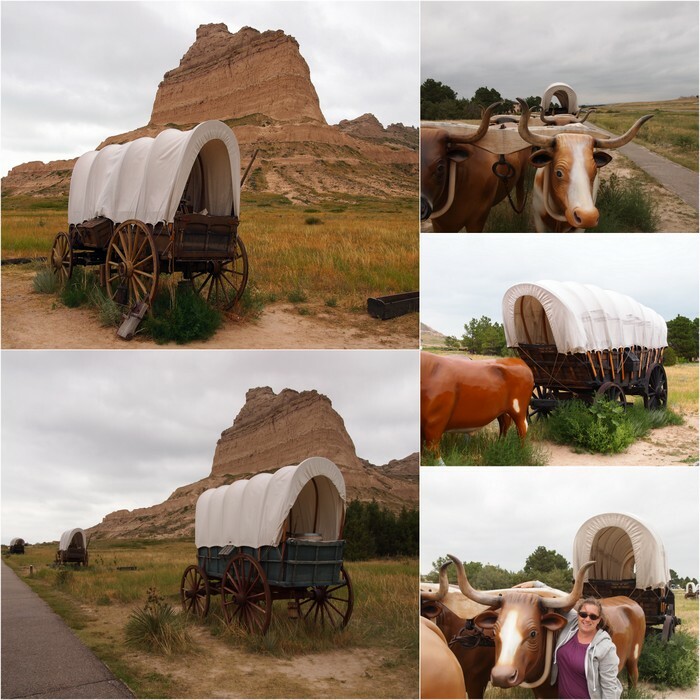 Our destination was Scottsbluff, Nebraska, a small town on the western side of the state whose main claim to fame are the 800 foot bluffs on the western edge of town that served as a landmark for the thousands of emigrants who traveled through on the Oregon Trail. 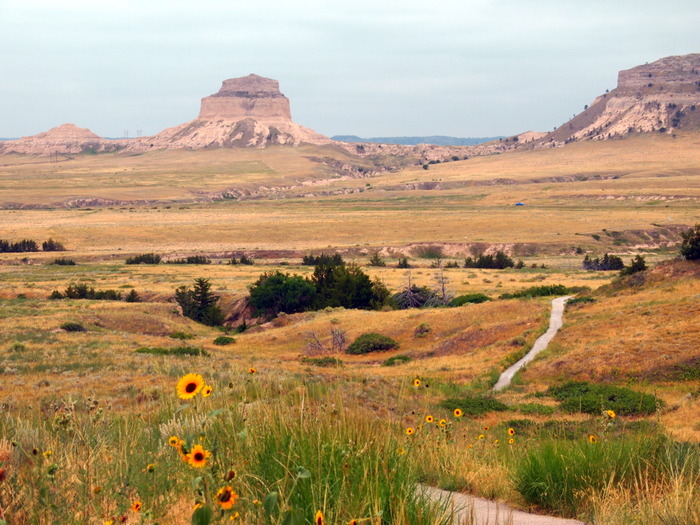 Like those travelers of years ago, Scottsbluff was merely a stopover for us. 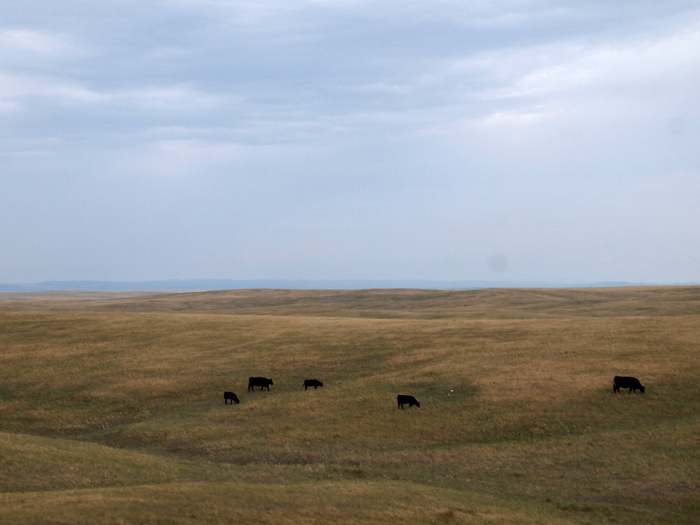 We planned to only spend one night before continuing north into South Dakota, and it turned out to be a nice place to spend the afternoon. 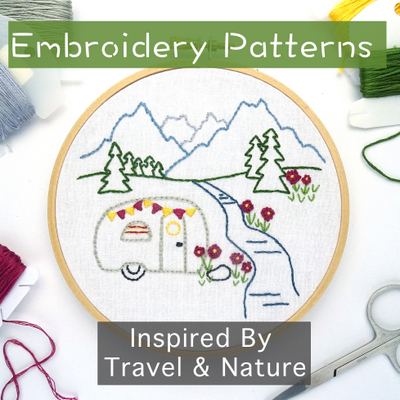 In an effort to keep our driving days interesting, and low-stress, we try to avoid interstates as often as possible. This can sometimes add time and miles, but when you’re only traveling 200 miles or less in one day it hardly matters. 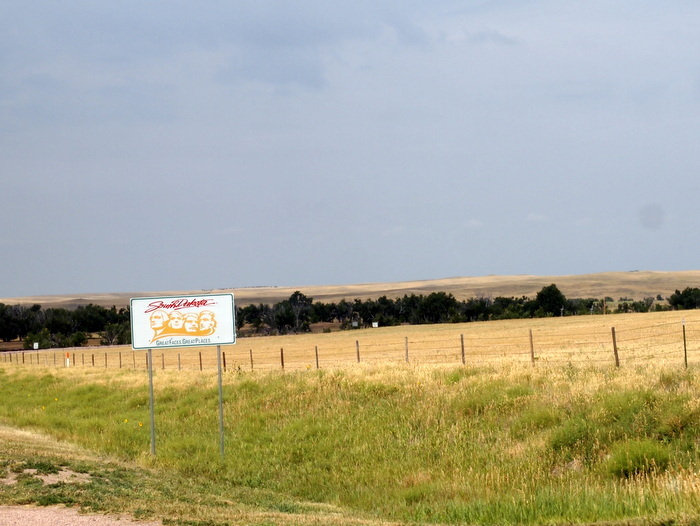 So instead of following the quickest route from Loveland to Scottsbluff, which would have taken us up I-25 into Wyoming, and then east into Nebraska, we chose instead to head straight east and then north. 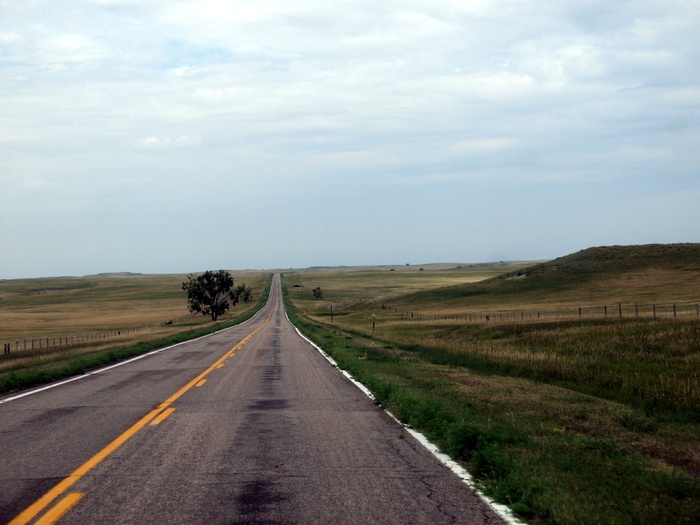 This route had us traveling two-lane roads through grass and farm land. 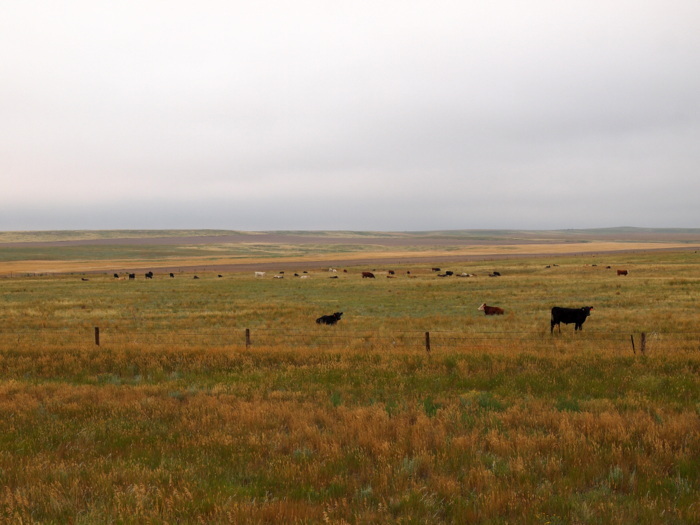 It was far from an exciting drive, but there is something soothing about traveling through mile after mile of nothing but soft rolling hills, corn fields, and waving grass- with a few occasional cows for interest. 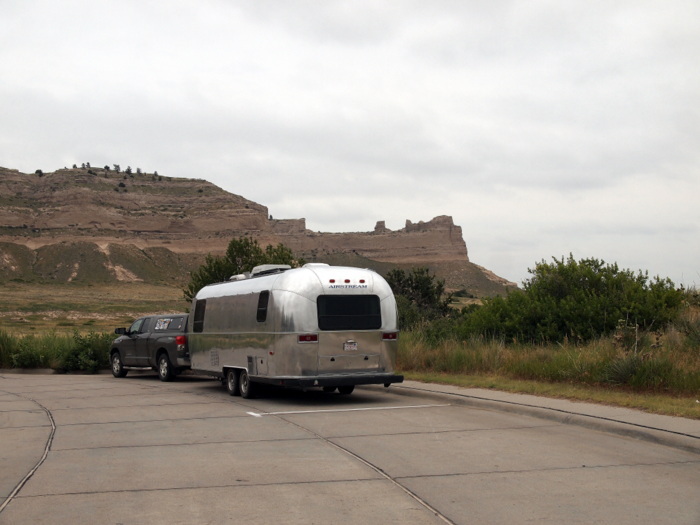 We arrived in Scottsbluff and headed straight to the Scotts Bluff National Monument. One of the things we love about national parks and monuments is that there is always reliable, dedicated RV parking. This time we even had a nice view of the bluffs while we ate our lunch. After lunch we explored the small visitor’s center that was packed with fascinating historical artifacts, photos and stories about all the travelers who have moved through this area over the years. Then we toured the covered wagon replicas and visited the stoic plastic bison. Next we headed out for a hike up the bluffs. 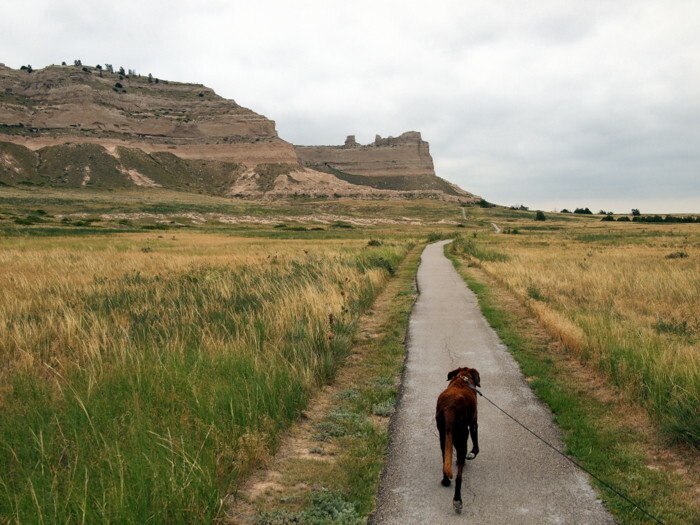 Much to our surprise this national monument allows dogs on the trail, so our pooch got to come along for some exercise. It was a fairly easy hike that clocked in at a little over 3 miles round trip. There were some long switchbacks that wound up the steepest uphill sections which made for an easy climb. Phineas gets tired on uphills these days, but we took it slow and he trudged steadily up the bluff. By the time we spent 10 minutes walking around the flat terrain at the top he was fully recovered and ready to race down the trail. Sometimes this old guy amazes us with his energy. I can only hope to be that spry when I am 91! On the way down we got an awesome view of one of bluffs along with some pretty wild sunflowers. 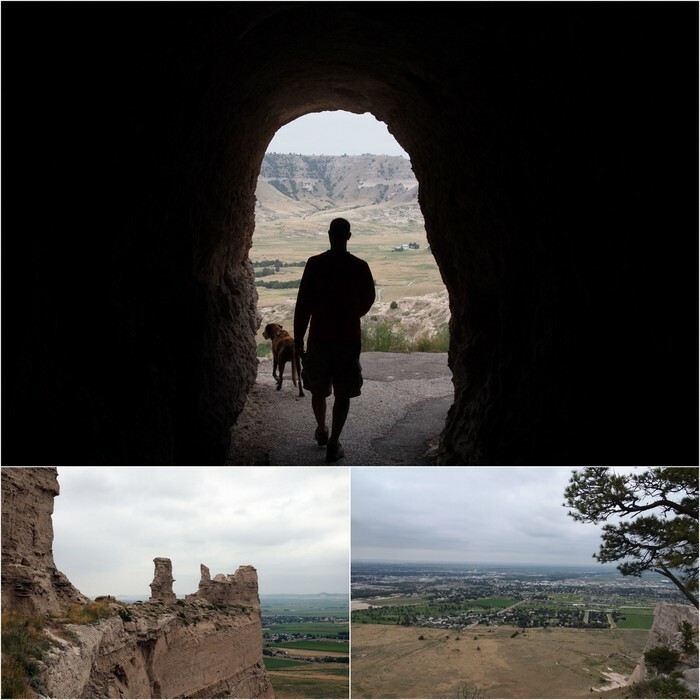 We spent our one night in Scottsbluff at the Walmart. Not the most exciting or scenic location, but it seemed silly to pay for a night of camping when we planned to leave first thing in the morning. At night spent at Walmart never results in a great night of sleep due to the inevitable road noise and street lights. This time we also had a rather obnoxious train that came through town once every hour loudly, and repeatedly, announcing its presence each time. I will never understand how people can live in towns with trains. 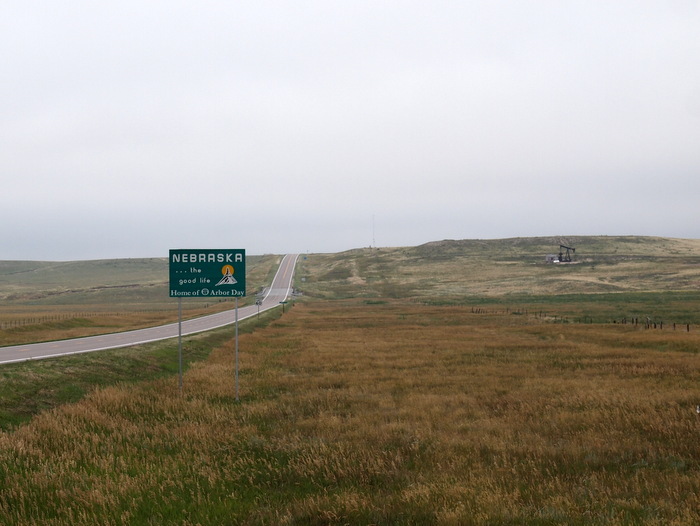 Despite our noisy night, we were up and out first thing for the remainder of our drive through Nebraska and into South Dakota. 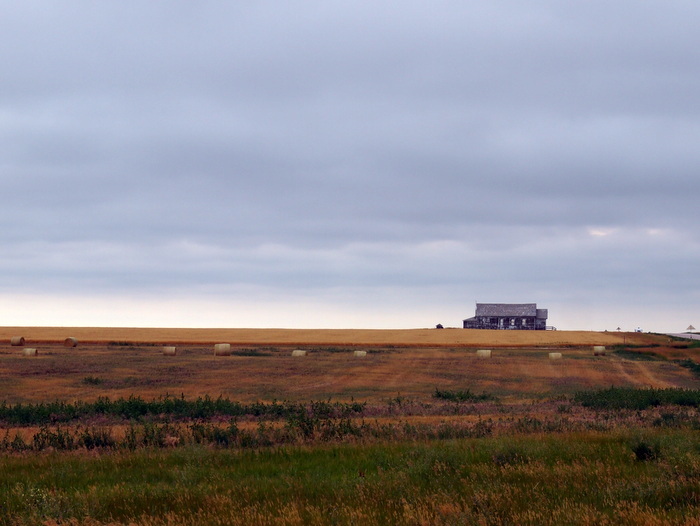 Once again we traveled on two-lane remote roads with nothing but mile and miles of fields as far as the eye could see. It was a cloudy, drizzly morning but I did my best to take a few out the window photos in an effort to capture the scene. 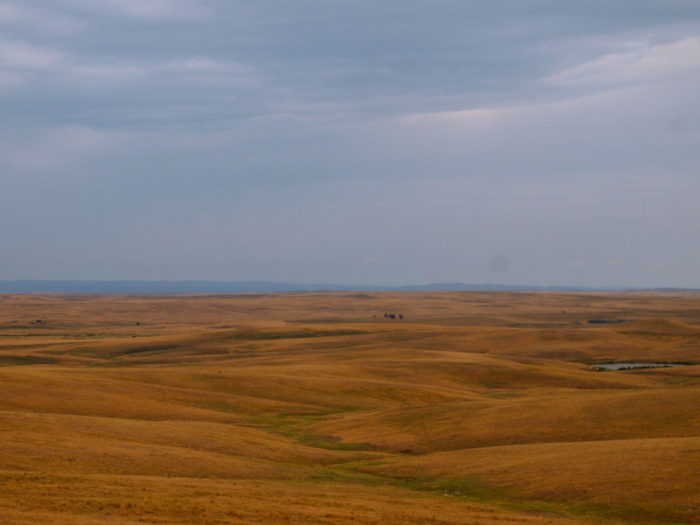 We entered South Dakota and gradually the terrain shifted from grasslands to low rolling hills. Well hello Black Hills, nice to see you again. This is the very first time in over a year of traveling that we have returned to a previously visited area. Last year we only spent one night the Black Hills before moving on, so hopefully this time we’ll get to explore a little more. Our home for the week is a very small, very quiet private RV park called The Roost Resort, only a few miles from the town of Custer. 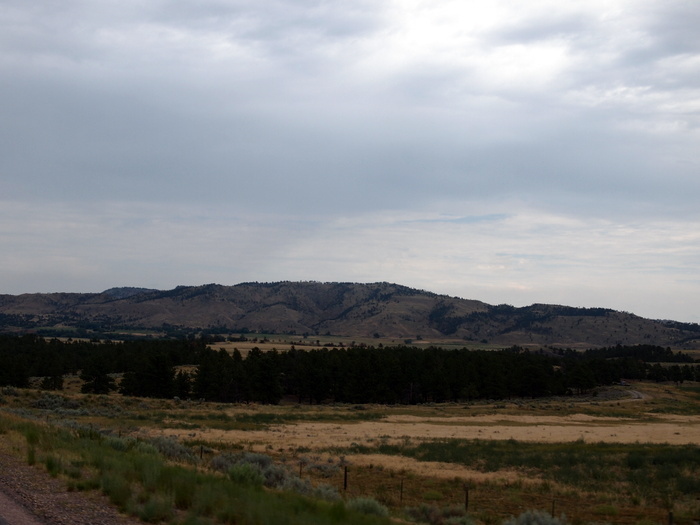 There’s only a handful of RV sites here and we have a nice view of the meadow and hills beyond. It should be a very pleasant week here in South Dakota. Good to see you on the move! Awesome…I enjoyed your trip too. I just love the way you stop and hike on your route. We have never done that before…might have to try that especially if the pups can enjoy it too. 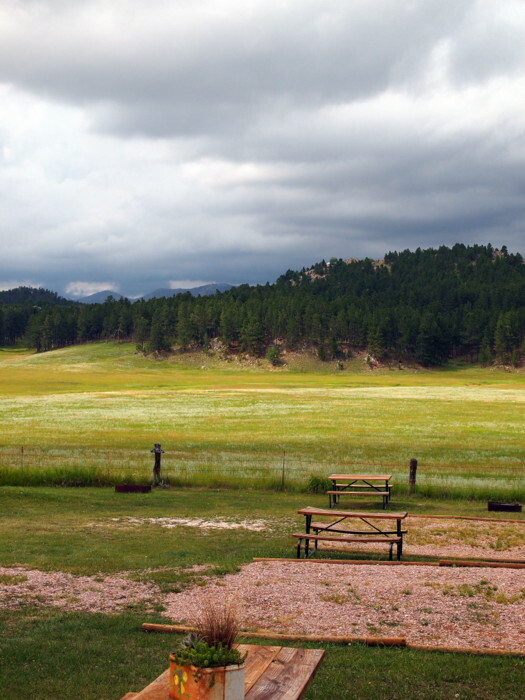 Your site in the Black Hills is beautiful! I can’t wait to read and see all the things you do there! I love your pics and stories. My wife likes seeing them, too.